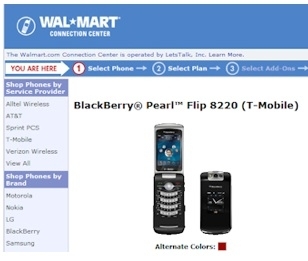 Walmart sells BlackBerry Pearl 8220 Flip for $99 | BlackBerry Blast! Not to be left out of the BlackBerry Pearl buzz, Walmart is now selling the BlackBerry Pearl 8220 Flip for $99 if you sign a two-year agreement with T-Mobile. They will offer the Pearl Flip in both red and black.